If you haven’t heard about the Rosetta mission, and the European Space Agency’s remarkable feat of landing on a comet, then you must be like it’s lander Philae: living under a rock. What you probably also didn’t hear much about is the slew of other ways (both recent past and near future) we are exploring up-close-and-personal the more unusual parts of the Solar System. The tiny stuff; the names you didn’t memorize in grade school. That one that doesn’t get to play with the “big boys” anymore. The years of 2014 and 2015 may well be known as the time when our exploration of the solar system truly took off, as we explored asteroids, comets, and minor planets. Here’s a look back at what we’ve accomplished in the last year, and what we’re about to achieve in the year to come. Scroll to the bottom to see an abbreviated list of important upcoming events for these missions. One of the biggest science news pieces of the year, the European Space Agency’s Rosetta spacecraft reached Comet 67P/C-G (right). It began an orbit on August 6th, 2014, after a journey of more than 10 years and 6.4 billion kilometers. On November 12th, the spacecraft’s landing probe Philae became mankind’s first object to land on a comet. Unfortunately, a malfunction in the landing system resulted in Philae bouncing a kilometer off the surface, coming eventually to rest in the shadow of a cliff. Unable to get adequate sunlight to charge its batteries, Philae quickly went into hibernation mode. Before shutting down it was able to return measurements of gaseous water vapor, but was unable to drill into the surface to measure the content of the solid ice. Many models suggest that the high water content of Earth may have come from collisions with comets or asteroids during the late stages of the Earth’s formation. Most water is made of ordinary hydrogen and oxygen, but a tiny fraction contains a deuterium atom (a hydrogen isotope made of a proton and a neutron) in hydrogen’s place. 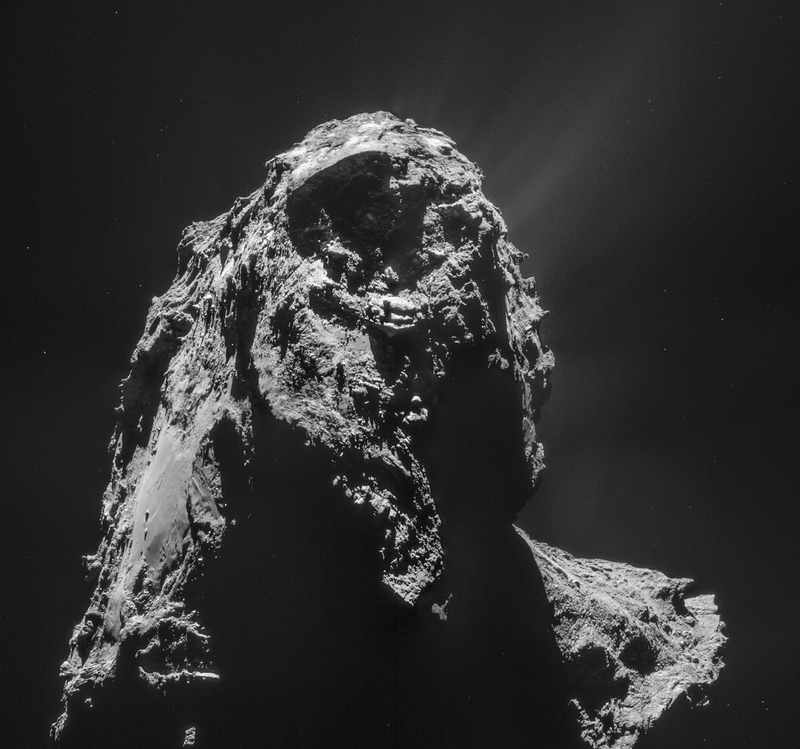 One of the main scientific goals of pursuing comets is to identify the source of Earth’s water. The key to accomplishing this is to see if the abundance of deuterium (see this Astrobite) in a comet’s water matches the levels found on Earth. Philae’s water vapor measurements indicate a deuterium abundance more than 3 times higher than on Earth. Perhaps this suggests asteroids are more responsible for Earth’s water supply than comets. The Rosetta team hopes to be able to confirm this result, and perhaps obtain an ice sample with Philae’s drill, if the lander wakes up. Most of the team has little doubt the lander will resume function in the coming months. But since the orbiting Rosetta still has yet to pinpoint Philae’s final landing spot, the question of when the probe will be able to get the 5 to 7 more watts of energy it needs is a tough question to answer. The comet (and accompanying spacecraft) is approaching the Sun and will reach its closest point in August 2015. The team hopes the change in scenery may bring more sunlight to Philae’s solar cells. In the meantime, Rosetta will make a close approach orbit of the comet in February 2015 — snapping photos which should resolve details down to a few inches — and is planning to soar through an outgassing jet in July, when the comet’s tail begins to form. The Rosetta mission is scheduled to end in December 2015, although large public support for the mission may help researchers extend its lifetime into 2016. 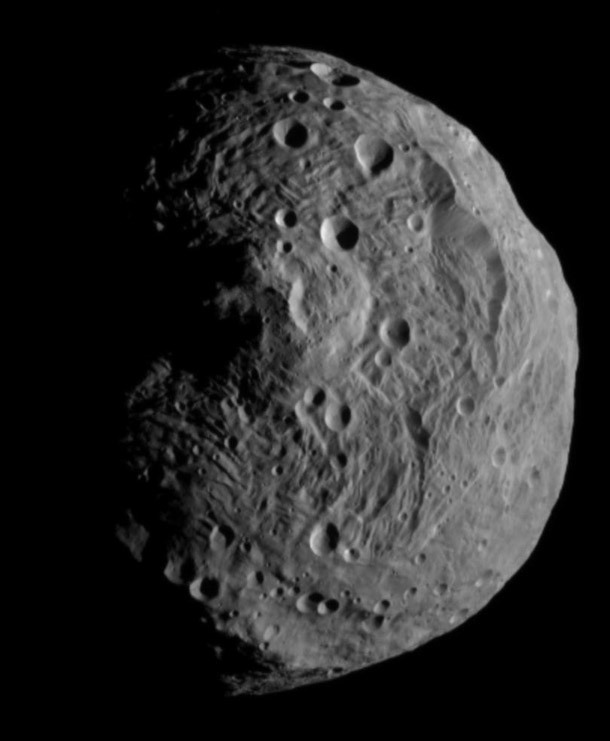 A few years ago, NASA’s Dawn spacecraft spent about 12 months orbiting Vesta, one of the largest asteroids in the asteroid belt. For more details about Dawn’s encounter with Vesta, see this past Astrobite. After leaving the orbit around Vesta, Dawn has spent two and a half years traveling across the asteroid belt to catch up to Ceres, the largest known asteroid. On its own, Ceres makes up about 30% of the mass of the entire asteroid belt. It’s so massive, its gravity is strong enough to shape it into a rough sphere, so Ceres is also identified as a dwarf planet. This week, NASA released the latest images of Ceres (left), taken as Dawn approaches the asteroid. In just a few weeks, on March 6th 2015, Dawn will enter orbit around Ceres. Asteroids and comets are pieces of the debris left over from the formation of the solar system planets. NASA wants to understand Ceres’ formation, its material makeup, and why it didn’t grow any larger. This information will help distinguish between theories that describe how planets formed in our solar system. As has previously been discussed on Astrobites, long distance observations indicate the presence of water on the dwarf planet. Just like comets, asteroids may be responsible for delivering the Earth’s water supply, and the Dawn team hopes to improve upon these measurements. Dawn’s main science mission continues until July 2015, after which it will be shut off and remain in orbit around Ceres for a very long time. Launched in 2006, NASA’s New Horizons has been navigating space for over 9 years, and has perhaps the most exciting itinerary of all the spacecrafts on this list. To save on fuel, New Horizons executed a gravity assist (or slingshot) maneuver around Jupiter in February 2007. Some beautiful photos of Jupiter resulted as an added benefit of this layover. New Horizons has been in frequent phases of hibernation since it’s encounter with Jupiter, and is now making its approach to Pluto: probably the most popular dwarf planet. 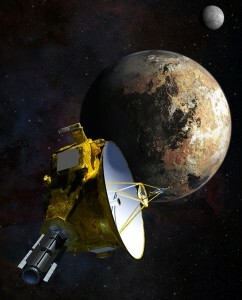 On July 14th 2015, New Horizons will make its closest approach within 10,000 kilometers of Pluto. The spacecraft won’t be stopping at Pluto, either, but will continue into the Kuiper Belt to investigate objects astronomers can barely see from Earth. To learn more about New Horizons, and its path after Pluto, see this Astrobite. With Rosetta, Dawn, and New Horizons continuing to gather information, the future looks bright for humanity’s goal of understanding our solar system. Asteroids, comets, dwarf planets, and Kuiper Belt Objects hold many clues for how the planets — including our own — formed from the initial ingredients around the Sun. In the next decade, NASA hopes to complete a mission to capture an asteroid and bring it into orbit around the Moon. This would be a remarkable opportunity to study the remnants of the solar system’s formation. February 2015: Rosetta makes close approach to Comet 67P/C-G, resolving features as small as several inches. It is amazing how many satellites we have out in the space and how much information they are sending to Earth! I did not it was possible to sustain a satellite solely with solar energy. However, if it is possible, why is it expensive to keep a satellite “alive” after it is already in the space? If/when Philae wakes up, is it expected to be in good working order despite its misadventures? As far as I know, the Rosetta team is hoping Philae will wake up in functioning condition, perhaps with some deterioration of its battery capacity due to such long inactivity. It’s a good sign is that Philae was functional for a short period after it landed, before it lost power. As long as nothing catastrophic happened to it while it’s been asleep, I’d put money down that it should be just a little groggy come it’s thaw out! Dawn’s mission to Ceres sounds so exciting! Are the individuals in charge of the mission going to intentionally shut off Dawn at the end of the mission? Would there be any way to extend its lifespan to gather more data? As I understand, Dawn will indeed be shut down after its primary mission ends in July of this year. This will leave it in orbit around Ceres for likely a long time to come, although it won’t be recording or transmitting anything. As with most space missions, the decision to terminate it most likely comes down to funding and person-power restrictions. A project, when proposed, must always have a planned end date. With enough public support or particularly surprising discoveries, I’m sure NASA could grant an extension of the project past its primary mission end date. Most likely, however, the funding and personnel currently supporting Dawn will be moved into a new NASA project, which sometime soon will surely be generating just as interesting of results! Hey Ben, there is constantly talk about the future of NASA’s manned missions. Do you think it is more feasible to go to Mars or an asteroid and which do you think would be more interesting? Do you know which will be getting the priority (I imagine only on would be picked). I would think that sending a mission to Mars will be more likely in the near future. It’s closer than most asteroids, and certainly more public-palatable (who wants to pay to send humans to an asteroid, unless its gonna kill us?) That said, with the lower surface gravity, it would likely be easier to land/return from an asteroid. NASA has also said it has a plan to send a mission to an asteroid, in order to pull one into orbit around the Moon. I’d love to see this happen, but am a little worried about whether it’s a project that the public will understand and be willing to fund. Really cool! I wonder what astrobiological implications will come out of these explorations. I wonder how the team hoping to look at Ceres data will be able to tell us about why it formed the way it did. What are things the craft is capable of measuring for Ceres? Since Ceres has a fairly significant gravitational pull relative to other asteroids, could it still be accreting matter and growing larger? Is there a possibility that it could one day, far in the future, reach planet status? Unfortunately, Ceres is going to have to be happy with its status as a Dwarf Planet. While it is the largest gravitational force in the asteroid belt, there is just nowhere near enough matter around it for it to accrete. The real asteroid belt is nothing like in Star Wars: asteroids of any significant size are few and far between. Ceres itself makes up about 25% of the mass of the entire belt, so even if it accreted EVERY OTHER ASTEROID, it would still barely make it on the planet scale.